Although LG has made big strides with its recent smartphone offerings, the company has missed out on that ever-elusive X-factor to propel it to the top of smartphone buyers’ acquisition list. Does the Optimus G have enough appeal to change this? To kick things off, it is important to note that South Africa received the Optimus G much later than most other international markets. As a result of this delay, this smartphone competes (at least in terms of its specs) with last year’s top end smartphones such as the Galaxy S3, HTC One X and Nokia Lumia 920 (review), as opposed to the latest devices. While the Optimus G (131.9 x 68.9 x 8.5 mm) will not easily stand out within a smartphone lineup, the device does feels noticeably classier in hand compared to the rest of its all-plastic Optimus stablemates that includes the Optimus L3 (review) and L7 (review). This is down to both the front- and rear of the smartphone being protected by Gorilla Glass, with the back cover integrating a reflective panel underneath the glass. When you hold the phone at an angle underneath a light source, a sparkling pattern catches the eye which makes for a nice touch. However, both the front and rear panels easily attract fingerprints and smudges. At 145 g, the Optimus G feels decidedly heavier in hand compared to its modern smartphone counterparts including the 130 g Galaxy S4 (review) and 137.5 g BlackBerry Z10 (review). Another design element that definitely won’t catch everyone’s fancy is the Optimus G’s unibody construction. This styling element means that the smartphone’s 2100 mAh Li-Po battery is non-removable and that users need to use the SIM-removal tool, or a particularly thin paper clip, to remove the microSIM card. It's not just the vampires from Twilight who sparkle, but the back cover of the Optimus G as well. 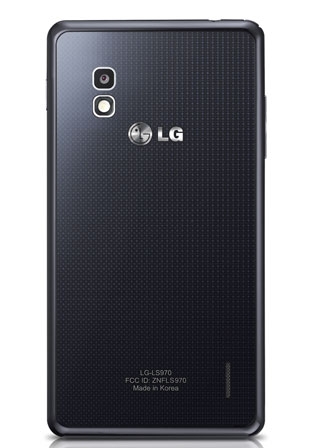 LG equipped the Optimus G with a 4.7" (768 x 1280 pixels; 318 ppi pixel density) IPS LCD capacitive touchscreen. In today’s terms, neither the display size nor the resolution are exactly class-leading, as the Sony Xperia Z (review) packs a 5" (1080p) screen and the HTC One (review) sports a similar sized screen (4.7") with a higher resolution (full HD). This screen employs Zerogap Touch technology to reduce the thickness of the display and deliver an enhanced viewing experience, especially outdoors in direct sunlight. The viewing angles as well as the outdoor visibility of the panel are excellent, while the colours are vivid, but not as eye-popping as on an AMOLED screen. The Optimus G boasts a handy 2 GB worth of multitask-accommodating RAM and is powered by one of last year’s fastest CPUs - Qualcomm’s quad-core Snapdragon S4 Pro running at 1.5 GHz per core.During benchmarking, the combo delivered a combined (productivity and gaming indexes) score of 7364 within Smartbench 2012, which is less than the Exynos octa-core powered S4 (10 686) and Snapdragon 600 powered HTC One (9783). The Optimus G did however virtually match the Xperia Z’s Smartbench 2012 tally of 7379, not surprising since it is powered by the same CPU. In AnTuTu v2.3, the Optimus G notched up a total score of 17 697, again struggling to match the One’s tally of 24 100 and S4’s even more impressive score of 28 158. With intensive graphical bench tests such as Futuremark's 3DMark for Android, the Optimus G churned out a respectable 7446 within Ice Storm segment and 4155 within Ice Storm Extreme. This means that although gaming performance in general was smooth, the Snapdragon S4 Pro’s onboard GPU (Adreno 320) was outmatched by the One’s system-on-a-chip (11 350 and 6725 tallies) and S4’s SoC with its respective scores of 9270 and 5836. Benchmarks are however not the be all and end all when it comes to smartphone or tablet performance. In terms of the general day-to-day performance, the Optimus G ensured a perpetually smooth and snappy experience whilst navigating the OS, opening, running and closing apps, as well as multitasking. 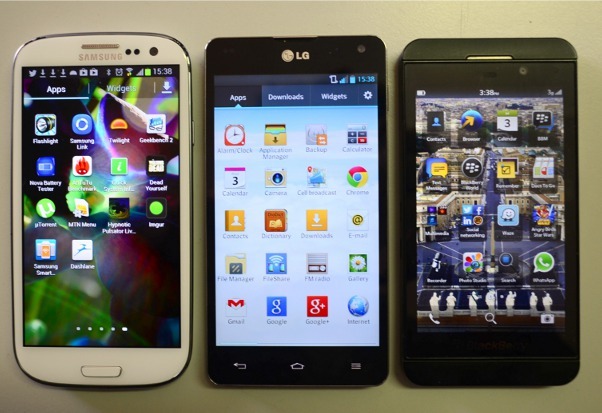 LG's Optimus G in the middle, flanked by the Galaxy S3 (left) and BlackBerry Z10 (right). 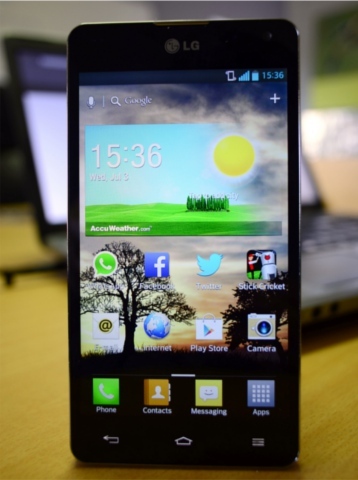 This smartphone runs on Android 4.1.2 (Jelly Bean) along with LG’s Optimus UI (v3.0) skin on top. Overall the Optimus UI is very functional, and does offer a high degree of customisation, starting with the home screen transition animations of which there are seven to choose from. The look and feel of the user interface is certainly not as visually appealing as Samsung’s TouchWiz Nature UX, but this also means that there’s less graphical bits and pieces to bog the SoC down.In terms of software additions, LG also adds a fair bit of extra functionality like its Korean neighbour Samsung. These includes QSlide which functions in a similar way to Samsung’s Pop-Up Play as first seen on the Galaxy S3 (review). QSlide is a video multitasking feature enabling users to watch a movie whilst continuing to perform another task such as browsing the web or replying to an SMS. Unlike Pop-Up Play which shrinks the video you’re playing into a moveable rectangle, QSlide provides a slider that enables you to adjust a video’s transparency on the fly. This might not be the most practical of features but makes for a visually stimulating one. Additional software additions from LG includes Live Zooming and Smart Screen, with the former allowing users to perform a pinch-to-zoom on screen in order to zoom into a video you are watching while it is playing. This is helpful if you want to see something in the video more closely, but is best utilised on HD-Ready or full HD videos only, as lower resolution videos tend to pixelate very quickly when zooming in. Smart Screen utilises the front-facing snapper of the Optimus G to track your eyes, to see if you are still looking at the screen and therefore prevent the the display from turning off. It works just as well as Samsung’s Smart Stay. LG's Optimus G smartphone packs lots of processing power under the hood, and couples this with lots of complimentary software features. At the back of the device is a 13 MP rear-facing camera, which is supported by a 1.3 MP front-facing snapper for video calls and capturing portrait shots. Overall the level of detail, colour representation, and image sharpness you get from the 13 MP shooter is impressive. However, the gap in performance between the camera of the Optimus G and rivals the like of the Galaxy S3 and HTC One X (review) is not exactly world’s apart. LG has, like a lot of other smartphone OEMs (original equipment manufacturers) such as Nokia, stepped up its camera game in terms of shooting modes. These include Time Catch Shot that is handy for parents that want to capture their child’s first steps for instance. It allows the camera to start capturing up to five quick shots even before you have pressed the shutter button, with users being able to choose the best shot from the results.Some of the other photo modes on offer include Smart Shutter, which adjusts shutter speed in order to capture non-fuzzy, crisp looking images, taking into consideration such factors as the movements of the person holding the phone and movements of the object being captured. We found this feature to be a bit of a hit-or-miss affair. Like a lot of other Android-based smartphones, users are able to capture HDR stills, panorama shots as well as burst shots. Another unique LG addition is to be able to capture photos using only your voice, simply by saying preset phrases including “cheese”, “kimchi” or “LG”. Although the feature works well, the slight delay before the photo is taken is a bit annoying. The Optimus G sports 32 GB worth of internal storage to store their photos, videos, apps and other content, but only 25 GB of this is available to the user. It is important to note that this storage is also not expandable, since the Optimus G, like the iPhone 5 (review), lacks a microSD card slot. What is onboard though is Bluetooth v4.0 with A2DP, dual-band Wi-Fi 802.11 n, Stereo FM radio with RDS, and LTE (4G) connectivity offering upload speeds of up to 50 Mbps and download speeds of up to 100 Mbps. LG’s Optimus G is easily the best handsets of the Korean company’s we have reviewed thus far.This smartphone feels expensive in hand (although a bit on the heavy side) and sports a blistering CPU under its bonnet. Add to this a capable rear camera, LTE connectivity and quite a few software feature additions from LG, and you have an incredibly decent smartphone offering on paper.The handset’s recommended retail price reflects the late launch that the Optimus G had in South Africa, coming in at R7 000 which is on par with the prepaid price of an S3 and a lot less than the newer Galaxy S4 (R9 000). We feel that Optimus G smartphone buyers will not be disappointed with the phone, especially if they were looking for something on par with, but a lot less common, than a Galaxy-branded device. Those who like the Optimus G but need a little more processing oomph and higher pixel count on the display, can wait until around September for the arrival of the Optimus G Pro. This smartphone sports a larger 5.5" (1080 x 1920; 401 ppi pixel density) True HD IPS Plus LCD capacitive touchscreen, is powered by a 1.7 GHz Qualcomm Snapdragon 600 quad-core CPU (also used in the HTC One), and unlike the Optimus G, the G Pro packs a microSD card slot that supports cards up to 64 GB in size. It is expected to retail in the region of R8 000. Great display, despite only being 720p rather than full HD. Smooth and fast performance courtesy of its CPU and RAM combo. Decent level of software feature enhancements. Feels a bit more premium in hand compared to other all-plastic rivals. Heavier than a lot of its rivals. Design does not allow it to stand out from the smartphone crowd. Lacks the brand appeal of the iPhone and Galaxy devices. Great display, despite only being 720p rather than full HD; smooth and fast performance courtesy of its CPU and RAM combo; decent level of software feature enhancements; really decent rear snapper; and feels a bit more premium in hand compared to other all-plastic rivals. Heavier than a lot of its rivals; design does not allow it to stand out from the smartphone crowd; and lacks the brand appeal of the iPhone and Galaxy devices.